Ooof. Look at that picture at the bottom. Pot roast is not the prettiest of meals, but it sure could look a lot more appetizing than I managed to capture in that picture. I opted to remake this recipe, not only for the picture but because I wanted to see if I could re-create it without using the cream of mushroom soup. I try to avoid using “cream of” soups because they’re full of sodium and unpronounceable ingredients you don’t really need in your meal. However, they do cut down time significantly in most recipes, so I won’t fault you at all for using them. I just wanted to see if I could reach the same consistency with a more homemade version. 1. Add the vegetable oil to a large dutch oven and heat over medium-high. 2. Brown the roast on all sides for 3-5 minutes on each side. 3. Add in the onion soup mix, water, carrots and celery and stir to combine. Bring to a boil, then reduce to a simmer and allow to simmer for 1 hour. 4. Add the mushrooms to the dutch oven and cook for 30 more minutes. 5. Remove 1/4 cup of the cooking liquid and put in a small bowl. Whisk in the flour until a slurry forms, then pour back into the dutch oven. Using two forks, gently break apart the roast, making sure all of the meat gets covered with the sauce. 6. 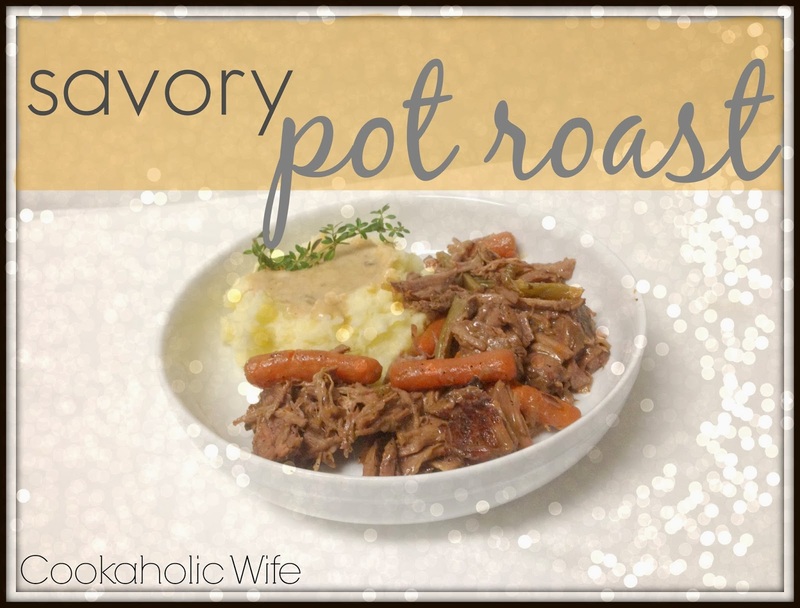 Serve the pot roast and vegetables alongside homemade mashed potatoes and drizzle all with gravy. Eliminating the cream of mushroom soup really doesn’t make a difference at all as long as you increase the amount of liquid for the beef and vegetables to cook in. We like a lot of gravy so I needed to make a second batch. I used the liquids from the pan, but needed to add stock to make enough. We didn’t have any beef stock so I used chicken which is why the gravy on the potatoes is much lighter. Even with my adjustments, this recipe is just as good as the original. I hope you’ll try out my slightly adjusted version. It is sad to admit, but I have never made a pot roast before. My mom always made them really tough so I wasn’t a big fan. I also had no idea what type of meat to buy. Then I found this recipe on Campbell’s.com and figured it was worth a shot to make it. I mean, it is Campbell’s, I’m pretty sure they know what they’re doing. 1. Heat oil in a large pan over medium high heat. Season the roast with pepper, garlic and meat tenderizer on both sides. Add the roast and cook on all sides until browned. 2. Add soup, water and onion soup mix to the meat and stir to remove clumps from the soup. 3. Add carrots and celery and cook for 2-3 hours, covered over low heat. 4. Transfer meat and vegetables to a platter and cut with an electric knife. I served this over homemade mashed potatoes with a little extra gravy and corn.